Nature’s Sunshine N-Acetyl Cysteine provides a line of defense against free radicals and toxins harmful to the body. 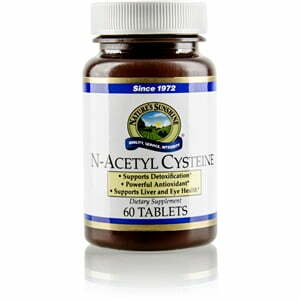 A precursor to one of the strongest antioxidants, N-Acetyl Cysteine benefits the liver, cardiovascular system, skin, and eyes. Nature’s Sunshine N-Acetyl Cysteine also contains turmeric, which aids the liver. Provides 250 mg N-acetyl cysteine per tablet. Dicalcium phosphate, cellulose (plant fiber), magnesium stearate (vegetable), silicon dioxide (powdered silica), Turmeric Root (Curcuma longa).